Rob Brydon, Louise Dearman and Jess Gillam join Joe Stilgoe and his magnificent seven-piece band for a one night festive spectacular, Joe Stilgoe's Christmas at the Movies at the Lyric Theatre on Monday 10th December. Highlights from the show will be broadcast on BBC Radio 2 at 2:00pm on Christmas Day. 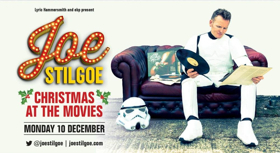 Joe Stilgoe's brand new show, Christmas at the Movies adds his own original and stylish orchestrations to some of the most memorable moments in movie history making them uniquely unforgettable. The guests this Christmas, include West End and international concert star, Louise Dearman (Wicked!, Guys & Dolls), award winning saxophonist, Jess Gillam (Classic Brit Award Winner 2018, BBC Proms 2018), and actor and comedian, Rob Brydon (Would I Lie to You?, Gavin and Stacey).